From 7 to 10 p.m., Friday, Aug. 5, at the Olathe American Legion Building, the public is invited to the 70th Anniversary Party/fundraiser for the Olathe Noon Optimist, which benefits the youth of Olathe. Chapter 2 will be performing songs from the ’50s, ’60s, and ’70s. Come enjoy the music while helping support the Optimist and Olathe’s youth. The Olathe City Council will meet Tuesday, Aug. 2, at 7 p.m. in the Council Chamber at City Hall for a regular session. Regular sessions are broadcast live on OGN (Comcast channel 7, AT&T channel 99 and on the City’s website). For a recap of the previous Council meeting, visit the City Clerk’s webpage. The Olathe City Council will meet Tuesday, July 19, at 7 p.m. in the Council Chamber at City Hall for a regular session. Regular sessions are broadcast live on OGN (Comcast channel 7, AT&T channel 99 and on the City’s website). For a recap of the previous Council meeting, visit the City Clerk’s webpage. 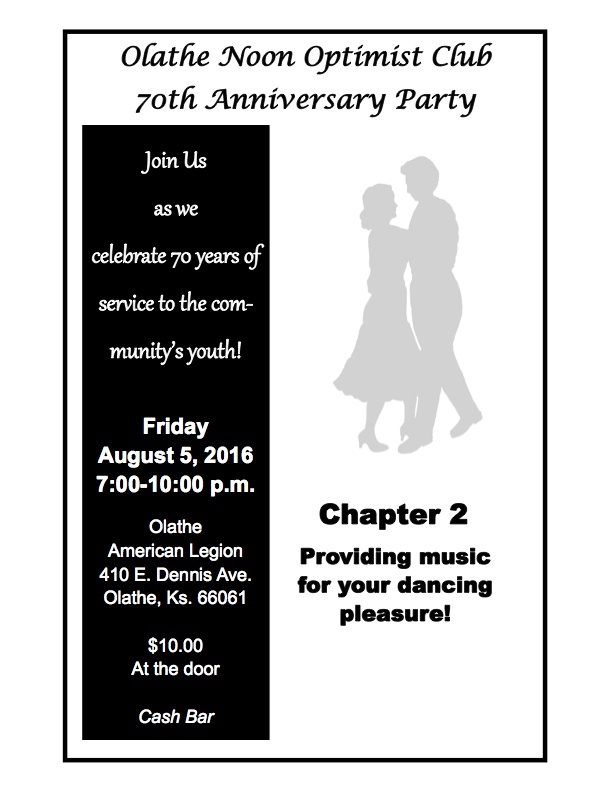 Next up for Chapter 2: 70th Anniversary Party for the Olathe Noon Optimist Club from 7-10 p.m., Friday, Aug. 5 at the Olathe American Legion Building. The public is invited. Enjoy mingling with old friends, meeting new friends, and shaking a leg on the dance floor while helping the Optimists raise money to help local children. 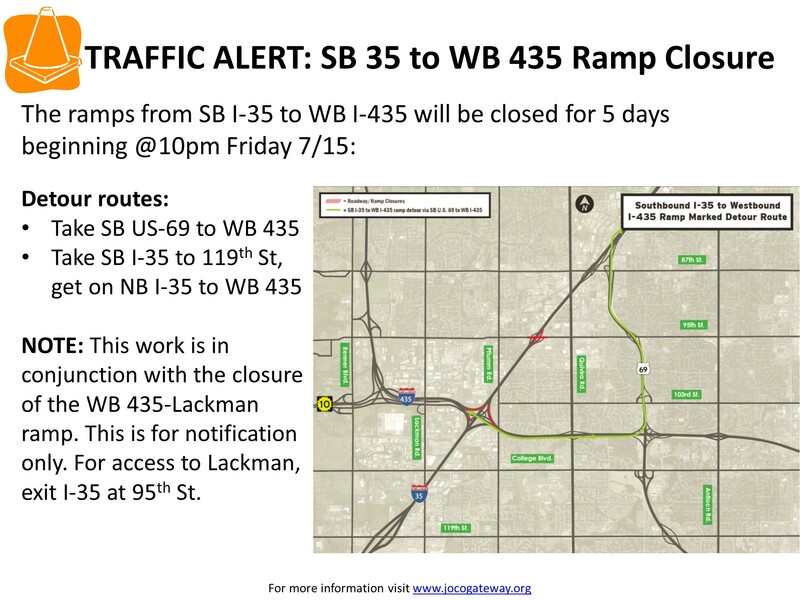 Starting this weekend, at 10 p.m., Friday, July 15, big changes are coming to westbound 435. Johnson County Sheriff’s Deputies are investigating a shooting at a home in the 16000 block of Gardner Place, Gardner, Tuesday night, July 11..
Deputies a male victim with non life threatening injuries who was transported to a nearby hospital for treatment. He has been transported to a local hospital for treatment. His condition is unknown. Two other males were being detained for questioning. The Johnson County Sheriff’s Office investigation continues.